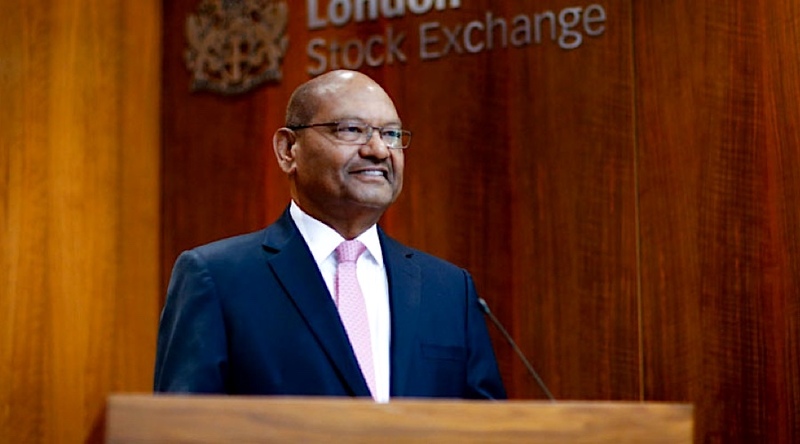 (Bloomberg) — Billionaire Anil Agarwal added to a string of commodities deals with plans to buy out minority investors in Vedanta Resources Plc, the resources group that he’s seeking to transform into one of the world’s largest. Agarwal’s Volcan Investments Ltd. will offer 825 pence a share for the 33.5 percent of Vedanta it doesn’t already own and plans to cancel its London listing. Vedanta surged on the news, which caps a tumultuous few months for the company that saw its shares drop last week to the lowest in a year. Agarwal has been one of the mining sector’s most dynamic dealmakers in recent years. He became the largest shareholder in Anglo American Plc last year, triggering speculation that he might drive a wave of consolidation in the industry. He has made a series of moves to simplify Vedanta’s sprawling corporate structure, including a merger with Cairn India Ltd. last year as he seeks to transform the group into a resources giant to challenge companies like Rio Tinto Group and BHP Billiton Ltd.
Vedanta "can be the second- or third-largest resource company in the world," Agarwal said in an interview earlier this year. Vedanta rose as much as 28 percent in London and traded at 819.4 pence a share at 12:02 p.m. The stock had dropped 20 percent this year through Friday as it faced protests and environmental concerns at some Indian operations. The London-listed company owns about 80 percent of Zambia’s Konkola Copper Mines and just over 50 percent of Indian-listed Vedanta Ltd., which in turn controls a series of units and subsidiaries with assets stretching from aluminum and iron ore to oil and power, according to a company presentation. The deal is "a natural progression of our journey to simplify the Vedanta Group’s corporate structure,” Agarwal said in the statement. A London listing was no longer necessary for the company thanks to "the maturity of the Indian capital markets," he said. It’s been a tough year so far for Vedanta investors. The company’s shares plunged in May as it was forced to shut a copper smelter in southern India following deadly protests. Earlier a court ordered a halt to iron ore mining in Goa on environmental concerns. The offer, which Volcan will table formally by the end of July, is a 28 percent premium to Friday’s closing price. But Vedanta’s shares were trading above 850 pence before the drop in May, and have trailed other major mining companies.